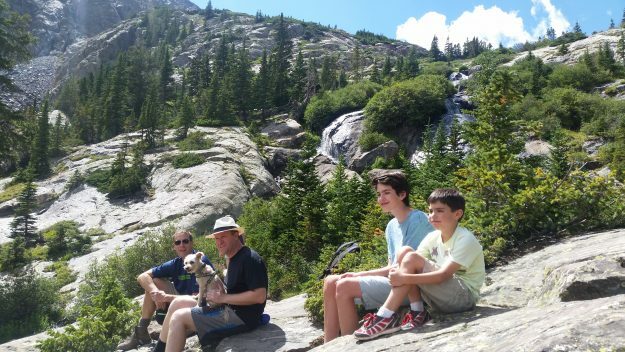 U.S. Rep. Jared Polis, his dog Gia and several constituents relax and admire the views in the proposed wilderness area of McCullough Gulch near Quandary Peak in 2016 (David O. Williams photo). Colorado Sen. Michael Bennet and Rep. Jared Polis on Wednesday introduced the bicameral Continental Divide Recreation, Wilderness, and Camp Hale Legacy Act to designate 98,621 acres of federal lands in Eagle and Summit counties as protected wilderness areas. Previously introduced in the House by Polis starting in 2014, the bill has never had a hearing in the Natural Resources Committee, let alone made it out of the House. Now it has a Senate version for the first time and includes the first-ever National Historical Landscape designation for 28,728 acres at Camp Hale. Bennet was working on a Senate version of the Polis bill in 2016 before President Donald Trump was elected on a Republican Party platform calling for conveyance of federal public lands to state control. With the backing of Utah lawmakers, Trump has moved to downsize national monuments in that state. Wednesday’s announcement was timed for Thursday’s kickoff of the Outdoor Retailer Snow Show, which moved to Denver this year after many years in Salt Lake City. The Outdoor Industry Association estimates Colorado’s annual revenues from outdoor recreation at $28 billion. Bennet said Utah’s loss was Colorado’s gain as far as the Outdoor Retailer show goes, and he added the timing is perfect to demonstrate Colorado’s support for federally owned and managed public lands. “I can’t think of a better case for public lands than the Continental Divide Bill that we’ve just introduced today,” Bennet said. Scott Braden, Wilderness & Public Lands Advocate for Conservation Colorado, says Utah lawmakers basically pushed the Outdoor Retailer show into the waiting arms of Colorado business leaders and politicians. Democratic former Presidents Barack Obama and Bill Clinton had expanded the two national monuments — Bears Ears and Grand-Staircase Escalante — Trump recently moved to downsize in Utah. “I’m not dissing national monuments, but [wilderness] is an attractive level of protection because it’s been through Congress,” Braden said, adding he’s hopeful this bill will someday become law. “Politics will change, things will be better, we all hope, in terms of conservation and Congress, and then if we can get a bill through Congress, that’s a really sustainable conservation win. Polis said he has a “high level of optimism” his bill will one day make it into law. Washington, D.C. – Ahead of this week’s Outdoor Retailer and Snow Show in Denver, U.S. Senator Michael Bennet (D-CO) and Representative Jared Polis (D-CO-2) introduced the Continental Divide Recreation, Wilderness, and Camp Hale Legacy Act. The Continental Divide Recreation, Wilderness, and Camp Hale Legacy Act would establish permanent protections for nearly 100,000 acres of wilderness, recreation, and conservation areas in the White River National Forest along Colorado’s Continental Divide. Among other measures, the bill would create three new wilderness areas while expanding three existing ones, protect Colorado’s only migration corridor over Interstate 70, and secure access to outdoor recreation in the Tenmile Range. The bill also would designate the first-ever National Historic Landscape around Camp Hale to preserve and promote the 10th Mountain Division’s storied legacy. The 10th Mountain Division that trained at Camp Hale led our nation to victory in World War II and then went on to create the outdoor industry, as we know it today. This designation would ensure the historic preservation of Camp Hale, secure existing recreational opportunities, and protect ecological resources with continued cleanup and restoration efforts. “We appreciate this continued support of the citizens and visitors of Grand County through this legislation to allow the National Park Service to continue educational programming at Trail River Ranch, at the gateway to Rocky Mountain National Park,” said Merrit Linke, Grand County Commissioner. Denver, CO (January 24, 2018) – As Colorado makes its final preparations to welcome the largest outdoor sports expo and conference to the Centennial State, Representative Jared Polis and Senator Michael Bennet introduced the Continental Divide Recreation, Wilderness, and Camp Hale Legacy Act to the applause of small business owners, veterans, sportsmen, mountain bikers, outdoor recreationists, musicians, artists, conservationists, and local elected officials. The legislation would preserve 96,445 acres of the White River National Forest in Summit and Eagle counties as wilderness, recreation management areas, and wildlife conservation areas. It also would designate Camp Hale as America’s first National Historic Landscape. For nearly a decade, a diverse and large coalition of local stakeholders has been working to conserve the public lands in the Continental Divide region of central Colorado. After many community gatherings, meetings with elected officials, and several draft proposals, the Continental Divide Recreation, Wilderness, and Camp Hale Legacy Act reflects the collective interests of many different constituencies ranging from mountain bikers and veterans to small business owners and water users. The legislation would create a recreation management area that protects world-class mountain biking and other recreation opportunities in the Tenmile Mountains between the towns of Breckenridge and Frisco. The legislation was first introduced by Representative Jared Polis in 2014, but previous versions did not include protections for Camp Hale. Home of the WWII-era training camp of the storied 10th Mountain Division, the Camp Hale National Historic Landscape would preserve a slice of history from the Greatest Generation. Ski troopers learned the unique skills necessary for winter warfare, and many of the soldiers who trained at Camp Hale returned home and founded Colorado’s outdoor ski industry, including Vail, Aspen and others. 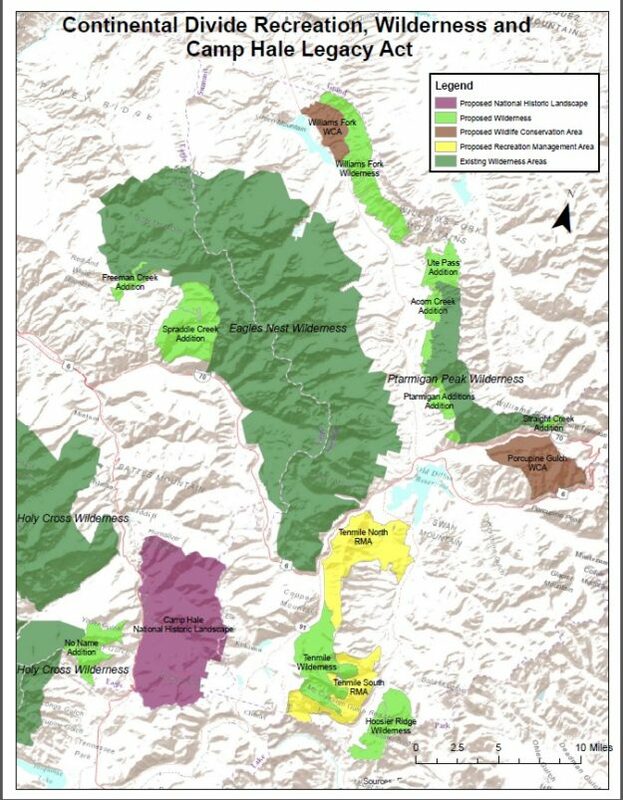 Protecting lands on the White River National Forest will safeguard ecologically important, mid- and high-elevation areas that provide vital wildlife habitat for black bear, elk, mule deer, bighorn sheep, mountain goat, sage grouse, moose, lynx, wild turkey, and the rare wolverine. Specifically, the legislation will create two wildlife conservation areas to protect critical wildlife linkages and habitat near Loveland Pass and in the Williams Fork Mountains. “Colorado’s high country attracts hunters and anglers from around the world who seek its solitude and backcountry. In addition to these public lands and waters which support robust populations of fish and wildlife, this legislation sustains our time-tested traditions of hunting and fishing for current and future generations,” added David Lien, Colorado Chapter Chair of Backcountry Hunters & Anglers. The Act would provide important protection for key watersheds, helping to safeguard pristine drinking-water supplies for local communities and cities along the Front Range and Western Slope. The Continental Divide coalition is urging Senator Cory Gardner to co-sponsor the legislation and is hopeful that Congress follows Congressman Polis and Senator Bennet’s lead and passes this bipartisan and sensible legislation.